Virtual reality, through all its parameters and characteristics, has probably become the most sold product in the world over the past two decades. It has turned into a cliché through over-use, over-dimensioning of the possibilities offered. Through the extremely rapid development of the commercial side, it has gradually become self-propelled, through the amazingly growing communications media, as the generator of contemporary kitsch. But obviously similar to visual arts, this pseudo-value does not eliminate the true consistency of the concept of virtuality. The commercial product really dominates our daily existence but at the same time it protects the real values, hardly accessible to the general public, of the virtual dimension. This tension between commercial and artistic virtual reality gave rise to the generating idea of ​​space club design, a redefined music program in the 1990s. 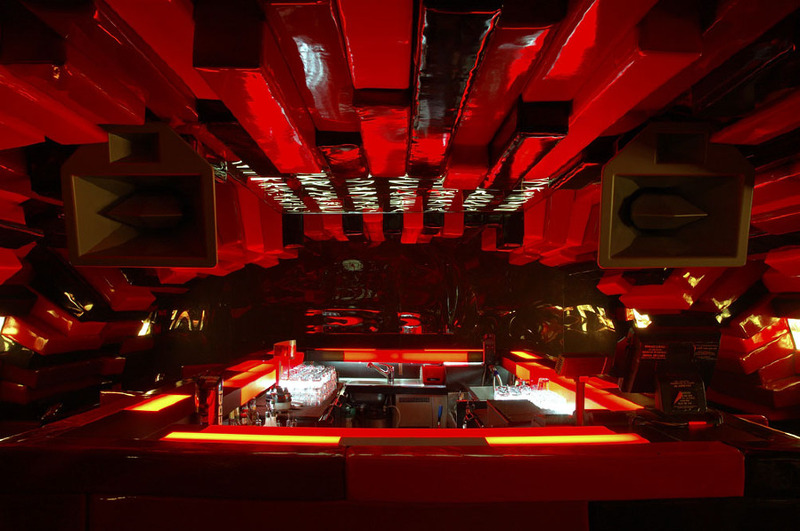 The Avi-cola Club in Târgu Mureş tries to illustrate and renegotiate the ambiguous relationship between the desires determined by this consumer’s virtual lifestyle and the requirements of the club atmosphere. 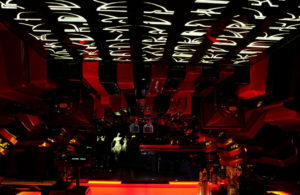 The XXI Century Club becomes an extravagant, eccentric, exclusive venue focused on satisfying the hyper-sensitized senses of the nightlife consumer, a crowded and extroverted but yet solitary and introverted public place. A space that feeds on tension, contradiction and dynamism. 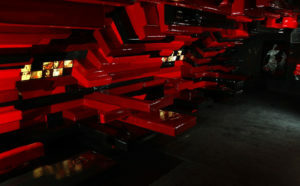 Architectural space becomes a support for the atmosphere, an interface between real and virtual. 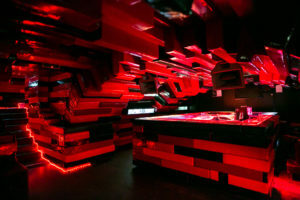 An interior space that is no longer linked to where it is, but becomes a port of connection to the world of entertainment, using all the products of this unique dimension. The very space itself becomes an environment that allows the individual to separate virtual from the surrounding physical reality and connect to a ephemeral world, known from various tangible sources, from well-chosen and controlled images of the media supermarket’s offers. We do not know exactly how an outdoor club is, but consumers are, we do not even want to know. Outdoor space is part of the real world in which we live and from which we escape. Approximately 1,200 pillows were designed, built and fitted inside the location. 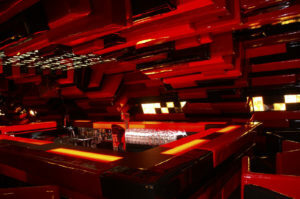 The club through its interior space and atmosphere becomes the substance that allows filling the gap between us and our fantasies. A club wants to be anywhere. But not anyway. 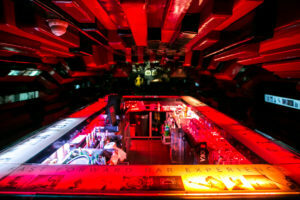 Almost all the elements that define it are identical all over the world - music, dj and vj, drink quality, lights, sound, air conditioning, jungle bartender, cocktails, glasses, cliché-atique waitresses, etc. . - so only the containment space can give it identity. Exploring the relationship between the physical elements and the desire to escape from them, Avi-cola has redefined the club's space starting from the approach of manga artists. They work with real elements in a predominant proportion, but by introducing a few virtual elements, apparently real and intriguing by their presence, places all the artistic product in the realm of virtual reality. Their method clearly expresses a desire to escape from the real world by creating a parallel, independent place. 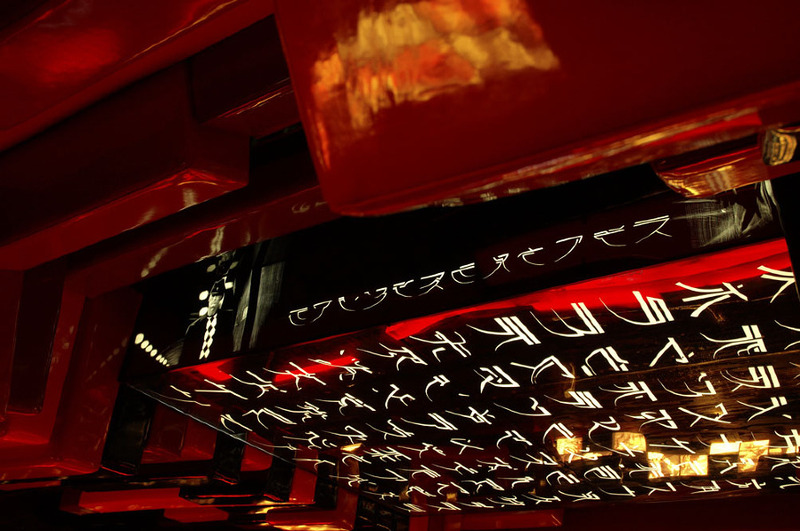 Above the bar - the Japanese manga style. The transposition of the manga concept into the architectural approach resulted in a language that abstracts the elements of real space and proposes a reinterpretation of them by virtue of the characteristics of the virtual images and forms. The inner space is redefined as a result of the containment space -permanent- and the space contained- the temporary intervention. Thus, the boundaries of the interior space become ambiguous and at the same time flexible. 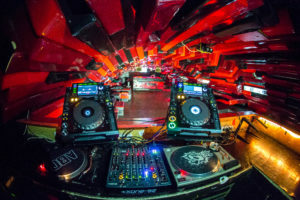 The first contact with the space of the club is the visual one, the choice of the forms and the materials of the interior was subordinated to the analysis of the virtual reality images. Already this first impression wanted to suggest artificiality, through the abstract forms of a brick vault that was camouflaged by a new shell or by the aggressive gloss of materials. But this new, seemingly violent and tough space has a soft, penetrating, transformable surface: it's a fake. By definition, the interface is the contact surface between two environments, which allows the exchange of substances between them. The physical space is at the limit of the illusion, the artificial, the imitation, thus creating a necessary support for a permissive atmosphere and free of context, in which the figure of the hyper-realistic dancer drawn on the wall wall seems to start to move slowly. 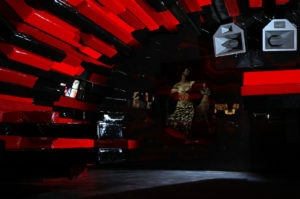 On her face is displayed the introvert of this exibitionist space, and her presence, deepening into the black-glossy wall, creates the illusion of the continuation of space, extending this virtual tunnel. It was a contradictory, ironic, but still sincere, environment. An almost unreal space, where you are invited to pass through the thin membrane of the walls and look back, seeing from the outside the virtual club you've been through. This work is available under the Creative Commons Attribution-Share Alike 3.0 Romania License.